Cowboy Cookies to Crush On! My freezer is empty of cookies. This is Not good. Cookie baking was a priority for this week. I saw this recipe a while ago on a favorite website; Gluten-Free on a Shoestring. I saved it and made a mental note to put it at the top of my “gotta bake sweets” list. Tonight I finally had time to throw it together. These cookies are created just like that; dump and blend and then there is a bit of stickiness in the shaping of them but no matter, just wash those sticky fingers and hands before you put on the oven gloves! I revised her recipe just a bit. 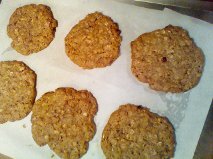 I like to use all dark brown sugar, I added walnuts, less vanilla and one batch I didn’t have quite enough Better Batter flour mix so I used a brown rice flour mix for the last ½ cup. I sometimes don’t bother to beat the eggs; added them one at a time though. I got the coconut chips at Freys Better Foods here in Hellertown, on sale this week! Cowboy cookies have been around a long time. Popular with cowboys I assume! I have provided the recipe revised by it was published by Nicole Hunn in her fabulous blog, a great resource for gf baked goods. They are sturdy and yummy. The flavor is a mixture of semi-sweet chocolate chips, cinnamon, brown sugar and oats with a healthy dose of butter. Totally. nummy. good. I never heard of them before my first batch although apparently they have been around for decades. I read today that Laura Bush baked a version of them in her smack down with another First Lady wanna be. Whatever. They are hearty and really big so I am guessing they might well be from Texas! My batch made 24 cookies, the recipe said 20…. So mine were a tad smaller than suggested but still really large. I ended up baking mine for 14 minutes so I suggest you do likewise. If you bake them one sheet at a time they should be done in 12 minutes but I would rather bake 2 sheets simultaneously. Some of the sets of six cookies were done on the parchment paper and one sheet was just on a cooking sprayed non stick cookie sheet. Both ways worked fine. They spread some but not a lot; leave some space between them. I plan to freeze most of them so they last a bit. I am guessing success will be my ability to pull one of these big boys out of the freezer and snack down after work next week! 1/2 tsp xanthan gum (omit if your blend already contains it) *BB does! In a large bowl, place the flour, xanthan gum, baking powder, baking soda, cinnamon and salt, and whisk to combine well. Place about 1 teaspoon of the dry ingredients in a separate, small bowl and add the chocolate chips to the bowl. Toss to coat the chips, and set the bowl aside. To the large bowl, add the granulated sugar and the brown sugar and whisk to combine, working out any lumps in the brown sugar. Add the oats and coconut chips and mix to combine. Create a well in the center of the dry ingredients and add the butter, eggs and vanilla, mixing to combine. Add the chips and reserved dry ingredients, and mix until the chips are evenly distributed throughout. If necessary to bring the dough together, knead it with your hands. Divide the dough into 20 pieces, each about 2 ounces. Roll each into a ball and place about 2 inches apart on the prepared baking sheets. Flatten each ball into disk about 1/4-inch thick with your palm or a big spatula. Place the baking sheets in the center of the preheated oven, two at a time, and bake until lightly golden brown all over (about 14 minutes). Remove from the oven and allow them to cool on the baking sheet for about 5 minutes or until firm before transferring to a wire rack to cool completely. Enjoy these fat and tasty big cookies; no one will ever guess they are gluten free! Postscript: these freaking cookies are addictive! They are subtly flavored by the combination of the above named ingredients. My grandson loves them too. He and I shared 2 this evening. I ate another one after I took him home. Trust me, they are the bomb! Post script: I made a new batch today. Note to self; follow recipe exactly and they are even better…. I make sure to beat the eggs first before pouring them on top of the softened butter and the vanilla. I also remembered to add the chips last and watch them closely in the oven. This batch is so yummy I had to put most of them in the freezer to keep myself from eating more cookies. Perfect warm out of the oven. OMG: I am in love with these cowboys! Be careful! These cookies are so delish everyone wants some…the batch I made a week ago is nearly gone. I am also to blame. I love them for their cinnamony chocolaty crunch! I guess I will have to make more this week!